After all the initial excitement of your engagement starts to die down (or, at least, the initial shock has worn off) it’s time to start thinking about engagement photos. These pictures signify the start of the rest of your lives together, so it’s important to consider a few things when picking a location for the shoot. The season will play a big part in the overall outcome of your engagement photos. If you’re taking them during the winter, consider asking your photographer to snap pics of you and your fiancé(e) having a snowball fight or sledding at the local park. If you’re more of an indoor couple, stay at home and document a cozy night by the fire. 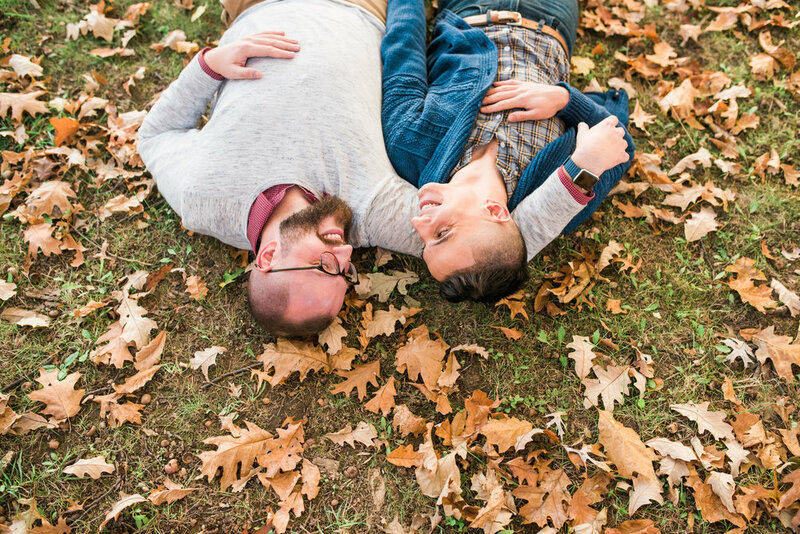 A fall engagement shoot is the perfect opportunity for shots at a pumpkin patch, apple orchard or simply taking advantage of the beautiful fall leaves. Summer calls for romantic beach snaps (or, since we’re in Pittsburgh, maybe stopping by a creek or waterfall), while the spring lends itself to a beautiful photo op in a public garden or park. Whatever season you choose, take advantage of what they each represent! If you’re not sure which season is best for you, I’m here to help. The time of day can totally change the vibe of the shoot. That’s why, for the most part, I only shoot at sunrise or sunset. Those are the times when the sun is at the perfect height in the sky for those dreamy golden shots. If you want to add a little more drama, continuing to shoot after the sun has set can make for some epic portraits as well! Think about the location you and your fiancé(e) first met, got engaged, or frequently vacation. Are any of these ideal spots for a photo shoot? Sit down for a cup of coffee at the café you had your first date, or let me snap photos of you both on the street corner where you had your first kiss. Did you first exchange “I love yous” at the beach? I’d be happy to capture you reliving that moment together. If your grandparents' camp is a special place where you two spent a lot of time, perhaps that would be an ideal place to capture your love. Maybe you want to have a cozy in-home photo shoot, where I document the simple moments that make up the fabric of your relationship. I am happy to go anywhere and shoot wherever it is brings you two the most joy. You’re also not locked into just one location. I’m happy to follow you around town, taking photos of the college or high school where you met. If the location you want to take pictures at isn’t feasible to get to, find somewhere close by that resembles the place that holds a special place in your heart. Do you two love walking your dog? What about golfing together or picnicking at the local park? Whatever it is you two enjoy doing together, why not let it serve as the theme for your engagement shoot? If you love going to the theater, I can snap pics of you outside your favorite local playhouse or at the cinema downtown. If you’re both huge baseball fans, take pictures at the stadium of the team you both root for. If you love horseback riding, I’m ready to document you out at the ranch. Not only will these make for pretty unique shots, but your shared hobbies will be well-documented too. If you have lots of hobbies but not sure which one is best suited for an engagement shoot? I’m here to help. Think about it: a shoot at sunset near the water is going to have a totally different feel than a downtown city shoot. Think about the vibe of your wedding and consider going for the same aesthetic in your engagement shots. Getting hitched at a fancy hotel in the heart of the city? Take your photo shoot to the streets and let me capture you hand in hand as you stroll down the sidewalk or through the local park. If a destination wedding is in the cards for you, a photo shoot by the lake or on an overlook may be the perfect complement. The setting of your wedding and engagement shoot don’t have to be identical by any means, but it’s a great way to set the overall tone of your big day. Do you want to get all glammed up for the pictures or would you rather go all natural? If you’re using these pictures as an excuse to rent a gorgeous gown and get your hair done, by all means, go for it! If you want a more relaxed and casual atmosphere for the shoot, that’s totally OK too, just think about it before you pick a location. Getting all gussied up and donning a floor-length gown might not be the best idea if your shoot is on a sailboat. However, shots on a hotel rooftop could be the way to go if that’s how you want to look. As I said before, think about the vibe of the shoot and how you want that to be reflected in your pictures. Still need help deciding on a location? Feel free to reach out to me, I am happy to assist in any way I can!